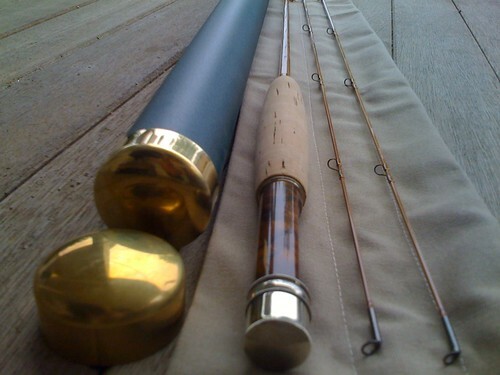 Many thanks to Gunpowder regular Brian Walsh for his thoughts on fishing his first bamboo fly rod. I wish to thank you for having the foresight to set aside the Little Falls for me. Something tells me that you knew I’d be back after reading A Wisp In The Wind. I’ve since blown-off both a meeting at work and a date with a beautiful girl…….. to stand in my backyard with a beer and the rod, casting to my dog’s chew toys, placed strategically around the lawn. All puns aside, I’m hooked. I also want to thank you and the guys for renewing my faith. My recent trips to the river and the shop have reminded me why fly fishing is among the purest of passions my Father imbued in me as a boy. The other day, after a thorough discussion with Rocky on the virtues and vices of trout fishing, I headed up to fish the few hundred yards just below the plunge pool. I had thrilling success there the week before with tan San Juans, and naturally had delusions of repeat business. Around noon, a #10 Woolly Bugger procured at the shop proved most useful in the pools, but unfortunately it was also highly attractive to many panfish, (which I had previously not seen in the river).At one point mid-afternoon, there were some playful Rainbows in the 8″ range leaping, rolling, gulping, and rising to some unknown invertebrate near a cut bank. After the painful rejection of numerous terrestrial offerings, #20 BWO’s worked wonders.The day’s trophy took a #16 bead-head, neon green nymph, (also picked-up off the counter at the shop). Fished this with a little weight, dropper style, through fast ripples…..(see attached pic). All the above rigged on 12′ 7X. Anyway, see you soon, and thanks again. This entry was posted in gear, reviews on October 3, 2008 by Theaux Le Gardeur.